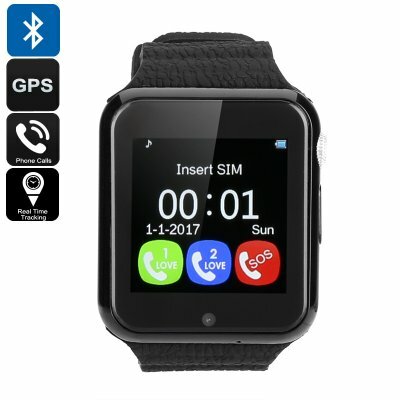 Successfully Added VK7 Child's GPS Smart Watch - GPS+AGPS+LBS, Geofencing, Realtime Tracking, Call, GSM SIM, Facebook, Twitter, WhatsApp (Black) to your Shopping Cart. With quad-band GSM SIM support and real-time GPS tracking, this kid's smart watch lets you keep an eye on your kids location any time of day. A smartphone partner app allows geofencing setup so you can receive alerts if your child leaves a preset area. Combined with GPS, AGPS and LBS you will have pinpoint real-time trajectory and location monitoring for the peace of mind that every parent deserves. Able to store up to 200 numbers this smart watch lets your child receive and make calls from prescreened numbers and you'll have the power to blacklist or block unwanted contacts to prevent harassment or bullying. An SOS function acts as an emergency caller so you can be contacted in an instant should the need arise. This will give you young ones the confidence to explore while knowing you're only a button away. The VK7 kids DPS smart watch has What'sApp, Twitter, and Facebook available letting your children keep connected with family and friends so it's ideal for older kids or teens. With a pedometer, sleep monitor and sedentary reminder you'll also be able to see just how active your child was and will be better able to understand their needs. having a 380mAh battery gets you up to 72 hours of standby time so a single charge will be enough for a day's usage, there is a built in camera and the slim build and light weight of this smart watch makes it comfortable for all day wearing.. The VK7 kids smart watch with GPS tracker comes with 12 months warranty, brought to you by the leader in electronic devices as well as wholesale smart watches and kids GPS trackers..